Will You Help Boots to Breathe Easy? At just two months old and weighing just over a pound and a half, Boots arrived at our Port Washington, N.Y. campus off a rescue transport from Virginia in dire need of medical care. The diminutive kitten was suffering from a serious ailment that left him struggling to breathe, but it wasn’t until reviewing the results of his X-rays that our veterinary team realized Boots’ condition was life-threatening. Will You Help Rudy Heal from Severe Trauma? No living creature should have to suffer the pain and uncertainty that Rudy must have felt as he lay helplessly on the side of the road after being violently struck by a car or truck. He was picked up by Animal Care and Control and rushed to Animal League America’s Pet Health Centers. After a successful reconstructive surgery, this 9-month old Tabby is recovering in a new Foster home. Take a moment to picture what it was like for Alex, a 2-year-old Domestic Shorthair who was brought to the Manhattan location of Animal Care Centers of NYC (ACC) with severe injuries to his face, head, and body. Presumably caused by a high-rise fall or being struck by a car or truck, it’s estimated that poor Alex, bloodied and battered, was left to suffer through his injuries on the cold, unforgiving streets of New York City for 24-48 hours before he was rescued. Lying uncomfortably on one of the examination tables inside our Alex Lewyt Veterinary Medical Center, there was no question Delilah was in the right place. Suffering from a painful leg injury and host of debilitating ailments, this sweet senior arrived off a rescue transport from Puerto Rico just weeks after Hurricane Maria. Not only was this ailing senior left to wait out the storm with a fractured leg, but three weeks post-surgery and approximately two months since sustaining the injury, she’s still unable to bear any weight on the leg. When Linguini arrived at our Alex Lewyt Veterinary Medical Center our staff noticed the fragile puppy was not only very young and understandably scared, but he had multiple congenital deformities to his face and mouth. Animal League America Senior Vice President and Chief of Veterinary Staff, Dr. Mark Verdino said Linguini’s birth defects were causing the fragile pup to have a multitude of issues, especially while eating and drinking, that could create a potentially life-threatening situation. 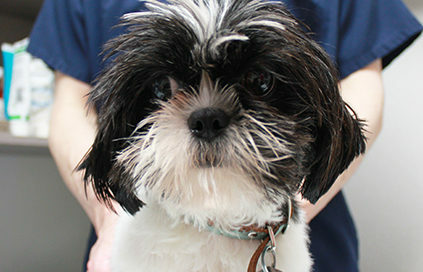 A day after Auton and 61 other dogs and puppies were rescued from the deplorable conditions of various puppy mills in the Midwest, the little Shi Tzu mix was nestled safely in the arms of Kennel Manager Rosie Tombolo. As she gently cradled him against her body on the short walk to his intake examination, Rosie noticed the adorable dog was struggling to breathe – letting out a steady wheezing sound that immediately raised a red flag with the veteran associate. Neglected and alone. Left to wander the streets of Brooklyn with no food, water, or shelter. Suffering from a painful skin condition that left her without a coat to keep her warm during the frigid December nights. This was the tragic life of poor Miley, a 6-month-old Pit Bull mix. Trixie is everything a kitten is supposed to be: adorable, lively, bright-eyed, and bushy-tailed. At least at first glance. Take a second look at this sweet, seven-week-old Persian mix and you’ll notice that her hind legs are limp and lifeless. And you’ll wonder, what happened to this little girl? In mid-September of 2014, North Shore Animal League America, received a phone call from local Police Department asking if the organization could spearhead another unique animal rescue mission. We were informed that there was an abandoned dog in a vestibule of an apartment building and asked if we could take it in for emergency medical care. Rescuing an abandoned dog isn’t an uncommon thing for the people of the Animal League, but finding one suffering and so badly neglected that it’s barely recognizable as a living animal, is.